Let shredded cheeses stand at room temperature for 30 minutes. Rub the bottom and sides of a heavy 1-1/2 to 3-quart fondue pot with the cut surface of shallot and garlic cloves; discard. Set pot aside. In a large saucepan heat beer over medium heat until small bubbles rise to the surface. Just before beer boils, reduce heat to low and stir in the cheeses, a little at at time, stirring constantly and making sure cheese melts before adding more. In a small bowl, stir together cornstarch, the water and pepper until well combined. Add to cheese mixture. Cook and whisk until mixture is thickened and bubbly. Transfer cheese mixture to prepared fondue pot. Place over fondue burner. To serve, spear desired dippers with fondue forks; dip into fondue, swirling to coat. (Fondue will thicken as it holds over the burner. If fondue becomes too thick, add a little warmed water.) 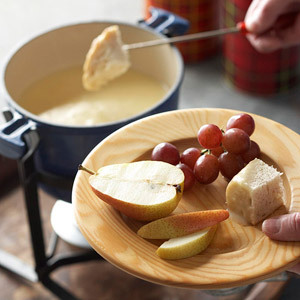 Makes 12 appetizer servings (3 cups fondue).